Last month TI announced it was the first to license ARM’s next-generation Eagle core. Today, ARM is announcing the official name of that core: it’s the ARM Cortex A15. Architectural details are light, and ARM is stating that first silicon will ship in 2012 at 32/28nm. Here’s what we do know. The Cortex A15 will be a multi-core CPU, designs can have as few as a single core but most will have 2 - 4 cores depending on their target market. The cores will all be superscalar out-of-order designs and support Long Physical Address Extensions (greater than 32-bit memory addressing). I suspect the cores will be an evolution of the Cortex A9. The Cortex A15 will support extensions to the ARMv7 instruction set to enable hardware virtualization support (among other things). The Cortex A15 will feature private L1 caches but a shared L2 cache (similar to the A9). The L2 cache is stated to be low latency and up to 4MB in size, although smartphones will probably see smaller versions. ARM is promising FP and SIMD performance improvements, but it isn't saying anything more than that. 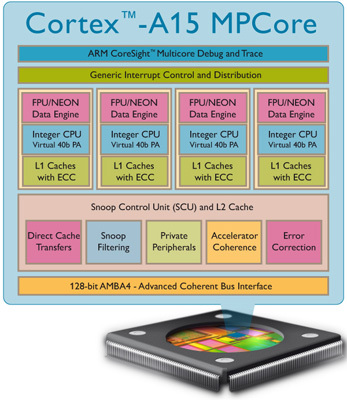 ARM is targeting more than just smartphones with the Cortex A15. This will be the architecture that ARM takes into the low end notebook and netbook market. That’s right, with the Cortex A15 ARM is going after AMD and Intel - it wants to fend off the impending x86 assault on its territory. In addition to notebooks/netbooks based on Cortex A15, ARM will also be targeting the server market with its next architecture. As Xeon and Opteron grow more powerful, so does the need for simpler, lower power consumption servers. We’ve seen some companies attempt to address this market, but expect the floodgates to open in a couple of years as ARM officially supports it. The Cortex A15 will also enable virtualization support, specifically for the server market. It’s too early to know anything about how well the Cortex A15 will do, but it’s clear that Atom (and maybe even Bobcat) are going to have to face a threat from below just as ARM is gearing up to face the threat from above. Given that the first Cortex A9 designs have yet to ship it’ll be a little while before we see smartphones, tablets, notebooks and servers based on Cortex A15. Today’s announcement is simply ARM’s statement of intent. ARM doesn’t plan on staying in the smartphone market forever, it has bigger things planned. "The Cortex A15 will support a new instruction set which ARM is calling ARMv7-A." From everything i know about these new ARM CPU's they will be faster than Atom. They need to be anyway, Atoms performance is pathetic at best. Um, in 2012 there is 28nm Ontario shrink and next-gen Atom. If everything goes well, they shall work well in iPads and thin clients and embedded devices of the time.